We foster team spirit to solve intriguing real world problems together. The EE program at UNT offers you a hands-on project-oriented education for development of state-of-the-art electrical/electronic/embedded systems by integrating theoretical concepts and practical insights. Students are well prepared for industry through semester-long projects executed every semester following an engineering product life cycle involving various stages from the requirement and fuctional specifications, through design to testing. Our focus on undergraduate and graduate research gives students greater opportunities to explore innovative ideas and place them at the forefront of EE technology. We foster among our students team spirit to solve intriguing real world problems together. Your coursework will feature "learning-to-learn" experiences in projects taught jointly by industry and university personnel. Active learning emphasizes the knowledge and skills you need to be successful in your future career. The department's design projects are part of the coursework, helping you learn creative bleeding-edge solutions to address today's engineering opportunities. More than 25% of engineering jobs are in electrical engineering. Median earnings for electrical engineers in 2015 were $93,010. Texas is the sixth top-paying state for electrical engineers, with an annual mean wage of $98,630. California is the top-paying state for electrical engineers in the country, with an annual mean wage of $114,150. Our graduates will have the basic experimental, design and communication skills needed either to continue on to the graduate level or to pursue careers in an extremely diverse field including government and industrial sectors, with job responsibilities in research, design, development, and operations. And that's just a start. More and more of the objects in our world are powered by electrical engineers. 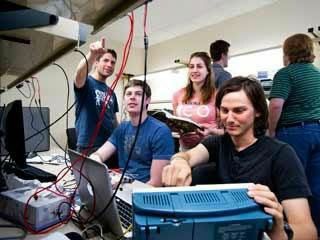 The Dallas-Fort Worth region has been especially attractive and rewarding for electrical engineers in recent years. Numerous local, national and international high-tech companies offer excellent career opportunities for electrical engineers. You'll have opportunities at UNT to conduct research, give presentations and publish articles in academic journals. Collaborating with faculty and graduate students, undergraduate researchers work with advanced equipment in our new facilities at Discovery Park. Undergraduate students have excellent opportunities to receive scholarships, assistantships and industrial internships. Fill out an application at ApplyTexas.org. You must meet all freshman admission requirements, or transfer admission requirments. In addition to the university admission requirements, applicants must meet the minimum requirements for admission to the College of Engineering. For applicants who do not meet the above requirements, admission will be granted to a Pre-engineering program in the College of Sciences. The applicant will be eligible to be admitted to the College of Engineering on completion of Math 1650 (Pre-Calculus) with a grade of C or better.